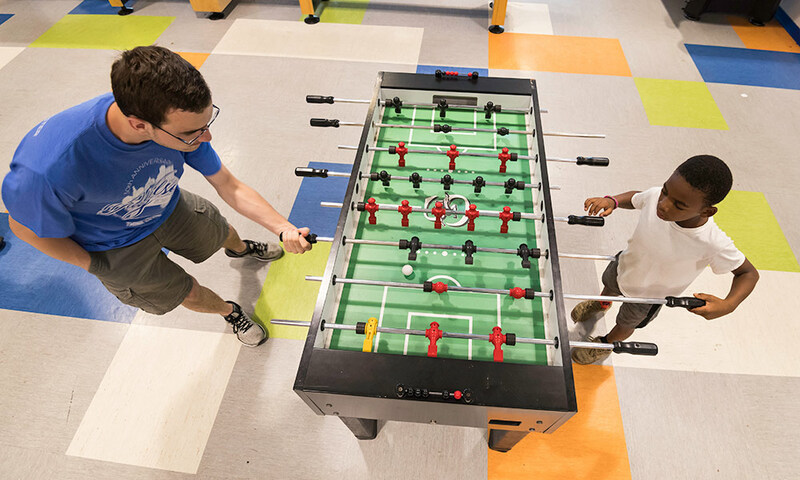 Charles Met ’22 knows little about the city of Rochester, so he welcomed any chance to venture into the community—including a game of billiards against elementary school children at the Boys & Girls Club of Rochester on Genesee Street. Met was one of about 1,300 first-year College students who took part in Wilson Day, the University’s annual day of community service that began in 1988. 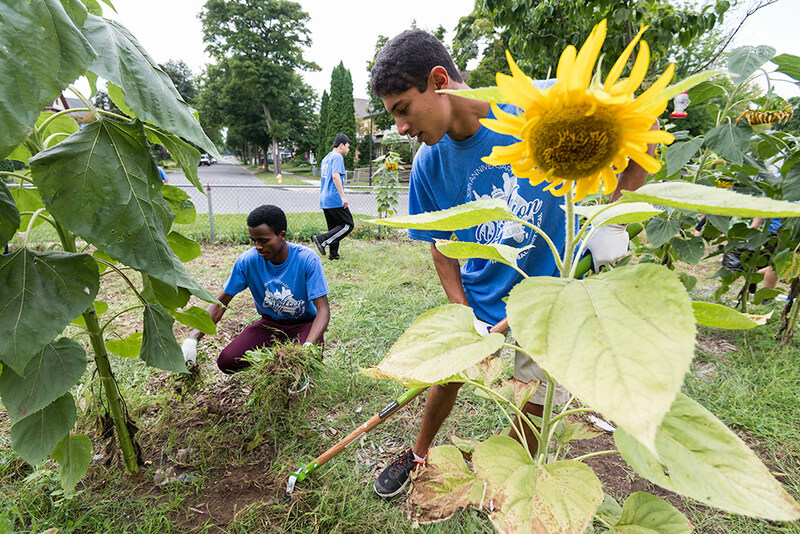 The students spent the afternoon working at 89 host sites around Rochester. 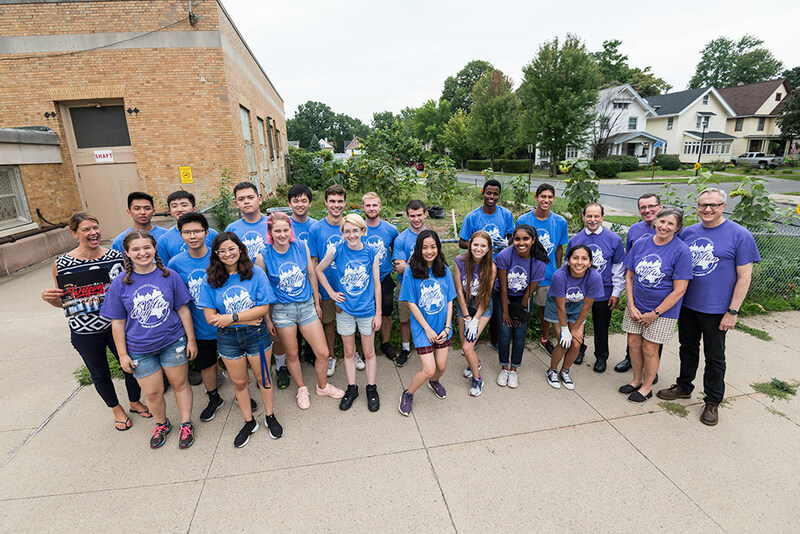 They set up school classrooms, played with children, cleaned senior living centers, put together snack bags at the Ronald McDonald House Charities, and performed yardwork at areas around Rochester. Wilson Day was the brainchild of Theresa Guenther ’90, who pitched the idea her sophomore year to then director of orientation (and later dean of students) Jody Asbury. At Monday’s opening ceremony, both Guenther and Asbury received presidential proclamations from University President Richard Feldman. 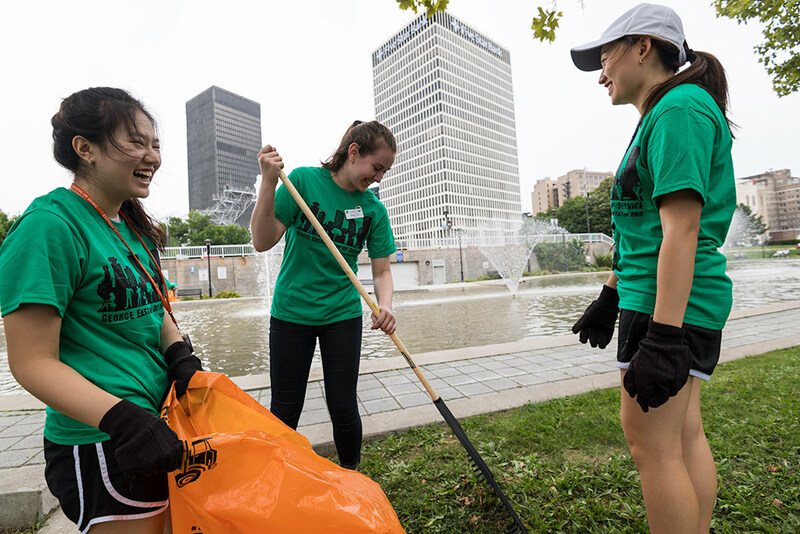 The Eastman School of Music also held its ninth annual George Eastman Day of Service, with about 150 first-year students performing a “clean sweep” of seven areas in the city. 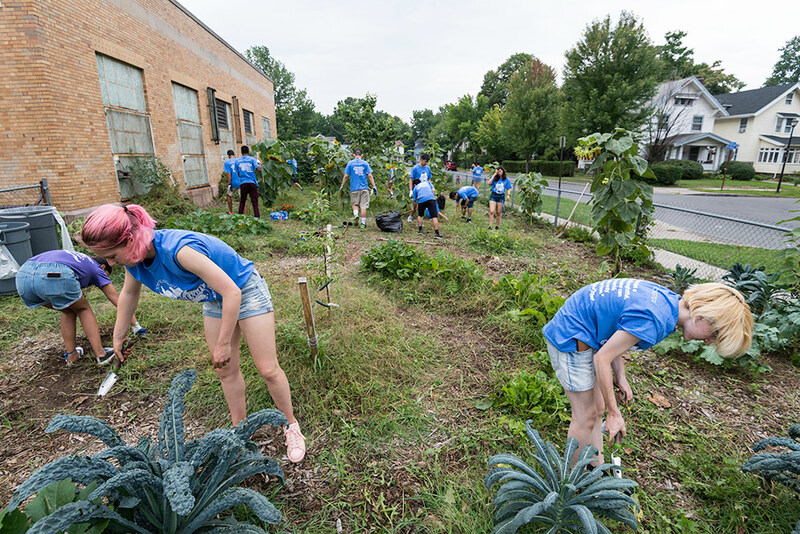 Brain and cognitive sciences major Eden Lambright of San Francisco, left, and molecular genetics major Jenn Jeffway of Somer, Connecticut, weed the community garden at Wilson Magnet High School during the annual Wilson Day. Math and economics major Dokata Kosi of Marsabit, Kenya, left, and electrical and computer engineering ajor major Aaron Sapollnik of New York City join in with their fellow first-year students in the annual day of service. From right, Dean of the College Jeffrey Runner, former Dean of Students Jody Asbury, current Dean of Students Matthew Burns, and University President Richard Feldman pose with the first-year students working at Wilson Magnet High School. Asbury was the dean of students when the annual Wilson Day tradition was started 30 years ago. From left, Seoyun Baek, piano major from Chicago; Abigail Cook, piano major from, Flagstaff, Arizona; and Tina Moon, violin major from Seoul, South Korea share a laugh as they clean up Martin Luther King, Jr. Memorial Park during the Eastman Day of Service. 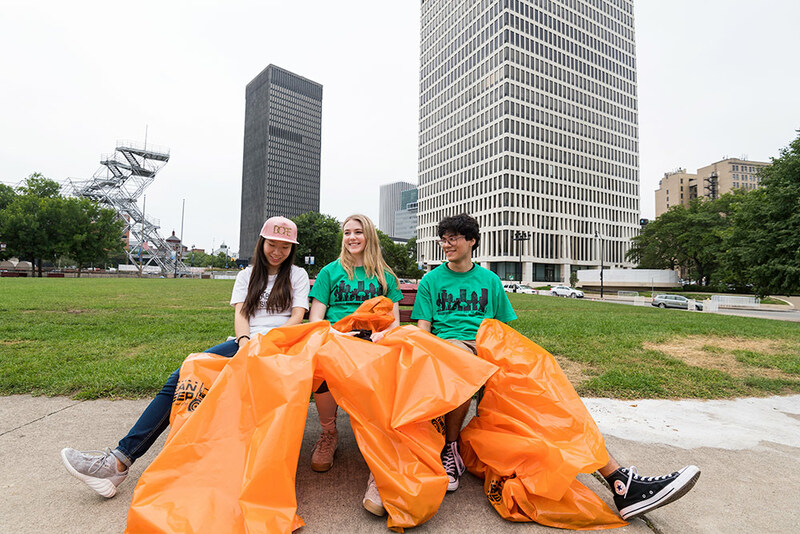 Taking a rest from their work in downtown Rochester, from left, Cheng Qian, piano major from Beijing, Anna Groesch, cello performance major from St. Louis, Missouri, and Gerardo Garcia, violin performance major from McAllen, Texas, pause from the activity of Eastman Day.